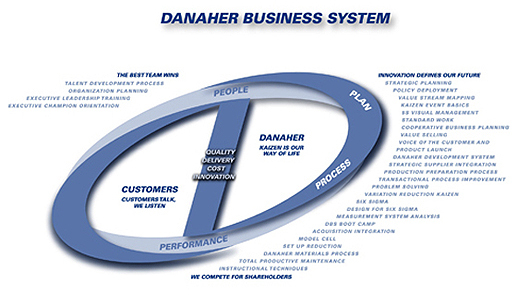 Last time I saw Danaher publishing their Danaher Business System was in their financial report 2002. Since then, the secret of the Danaher Business System (DBS) has been kept in secret (see article) . As Danaher is growing continuously it seems to be more and more difficult to control the communication online. Kollmorgen, a Danaher Company, is now revealing the original DBS Banner including the core values of Danaher. If you just see a broken link, than Kollmorgen is not providing the picture anymore. For Copyright reasons, we do not copy and provide this picture. But not only Kollmorgen is publishing the DBS Culture Picture on their page. Also Thomson is providing it on the internet.